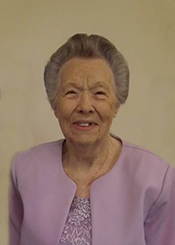 Elner Adline White, 92, of Nederland, died Monday, April 15, 2019, at Harbor Hospice, Beaumont. She was born on July 10, 1926, to Nettie Johnston Campbell and Ira Campbell, in Fort Necessity, Louisiana. Survivors include her daughter, Pat Gherardini and her husband, Don, of Slidell, Louisiana; son, Reverend Rick White and his wife, Susan, of Beaumont; sister, Carla Cormier and her husband, Bobby, of Welsh, Louisiana; brother, Tommy Campbell and his wife, Julie, of Lake Charles, Louisiana; sister, Sharon Taylor and her husband, Rusty, of Jennings, Louisiana; brother, Ronnie Campbell, of Lake Arthur, Louisiana; seven grandchildren; and fourteen great-grandchildren. She is preceded in death by her husband, Poston White; daughter, Dianne Samples; two sisters; and six brothers. A gathering of Mrs. White’s family and friends will be from 4:00 p.m. until 7:00 p.m., Wednesday, April 17, 2019, at Broussard’s, 1605 North Major Drive, Beaumont. Her funeral service will be at 1:00 p.m., Thursday, April 18, 2019, at Christian Fellowship Worship Center, 3950 Pointe Parkway, Beaumont. Her interment will follow at Oak Bluff Memorial Park, Port Neches. Enjoyed so many wonderful times with you and Diane as children at our home and at Aunt Nettie and Uncle Henry. The screened in porch and Aunt Nettie playing the piano. Great times!!! I was very sorry to hear that Aunt Elner passed away. Please accept my condolences to you and Ricky during this time. Much love to you and your families. To the family, it was my honor to try and help you during your time of need. Ms. White was always so sweet. May God bless and keep all of you.